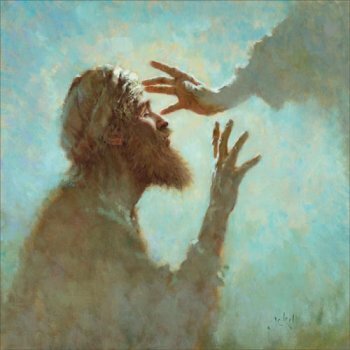 Chapter 9 Tells the story of the man blind from birth whom Jesus healed. Becoming a controversy amongst the religious and those who were relatives of the formerly blind man, because it was on a Sabbath that the man was healed and the religious had made a pact that anyone who accepted Jesus as the Messiah would lose their place in the synagog. It can be a strange journey living a life of commitment to a God who chooses to cloak Himself in mystery. Often times we are left to our memories to help us shape what our next actions will be. Other times it’s the stories in the Bible that help shape our actions. Either way for us who live surrendered to the Lordship of Jesus there was a moment in time when the supernatural took over the natural, a miracle when God healed us of our blindness and awoken us to the reality of His presence. And yet we judge others as Godless who have had no such experience. Out of all the characters in John 9 the man who was born blind is the only one who had experienced the miracle of God first hand. As a result, he was willing to be rejected by everyone, was willing to be removed from the current religious institution, and even make Jesus Lord right in the face of His fiercest competitors. This is what the people around us need- a real encounter with God. We share our stories of what we have seen and heard, but it is not our job to save people. There is only one name under heaven that men can be saved by, Jesus Christ. It’s time for us to quit trying to be God’s salesmen- walk in proper relationship with God and our neighbor- and let God be God. We gotta quit looking for a way to evangelize and be evangelical. Taking time to talk with God about those around us. Praying for our friends and meeting them right where they are. The best thing we can do for the world around us is to live our lives with God as authentically as we know how. To share with others as He leads and to let God be God. After all, a God initiated miracle will go much farther than a man derived one.